How do we create positive energy? What can we do today to drive performance? Is our team headed in the right direction for our organization, and is that clear in our team member’s priorities? How do we support each other in coming up with new ideas? Are we learning to lead? Can we each bring our true selves to work? Do each of us have a sense of ownership in our organization? eePulse started Energy Pulsing in 1996 to commercialize Dr. Theresa Welbourne’s research on the drivers of long-term firm performance. The work showed that employee energy, sense of urgency, trending and frequent measurement are all key to optimizing human energy at work. Energy Pulsing quickly engages employees in short, focused dialogue about energy, the drivers of energy and energy direction. Energy Pulsing is a frequent (monthly, weekly, every other week) process. Trend data, not point-in-time data, are needed to make fast change necessary for growth in sales, profitability, market share and innovation. Energy Pulsing uses eePulse’s signature Energy Pulse measurement system. 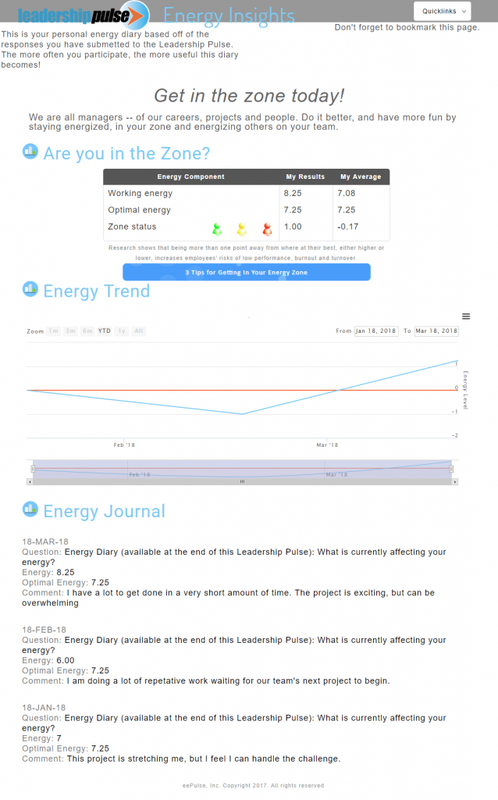 In addition, eePulse customizes the Energy Pulsing engagement by developing customized metrics strategies for clients. eePulse liberally uses appreciative inquiry techniques, coaching dialogues, influence questions, and validated constructs to accelerate the client’s achievement of goals. Energy Pulsing starts a data-driven dialogue, and it is the continuous nature of the updated dialogue and conversation that moves the business forward. Leaders spearhead the evolving organizational conversation, which is designed to influence and direct energy at work. Energy Pulsing feedback and learning are provided not just to managers but to all employees. Each person who takes participates receives their own personal energy diary. Here they can view their energy and view their own energy trend over time and easily look back over time and see what was causing them to be over-energized, under-energized, or at their best. Employees can see the patterns necessary to allow them to manage their own energy. Leadership confidence is a lot like consumer confidence. When consumers are confident, they buy more. They go ‘above and beyond’ and spend money to purchase things they need, and then they start buying items they desire (beyond basic necessities). When employees and leaders are confident, they too go ‘above and beyond.’ They share ideas; they help others; they put in tremendous energy and hours to succeed, and they help their organizations grow. We have been tracking leadership confidence since 2003 with the goal of further understanding what drives confidence, how confidence leads to outcomes, and to see if confidence changes match our patterns of consumer confidence and business growth. There are seven questions we have been tracking in the leadership confidence index, ranging from confidence in the organization’s leadership team, the economy, the organization’s strategy making process, as well as an individual’s personal leadership skills. An energized and engaged team is important, but direction is vital to make sure they are exerting their energy on the right things. This is where traditional engagement research often comes up short as it does not answer the “engaged in what?” question. Our direction pulse is only 4 questions, but is useful in revealing your team’s understanding of their personal, team, and organizational priorities and whether they see alignment between them. When this question set is examined at the organizational level, it provides insight into where the organizational strategy is being most effectively carried out and where additional clarity is needed. This leads to employees who know that they can be successful when challenged, and who can react quickly and appropriately when the challenge becomes to big. Teamwork is crucial for both the individuals experience as well as for team success. Individuals who feel they are going through a shared experience, whether positive or negative, remain more energized, are less influenced by set-backs, and are more focused on their role in the overall goal, Teams of such individuals are more capable of achieving high quality, creative output, and timely delivery of solutions to complex issues. Digital badges are presented by organizations to recognize accomplishments for specific actions or skill development. They allow you to be identified for these accomplishments and allow you to publish the badges representing that you have successfully completed the action or activity. As you earn badges, you accumulate your own unique collection and share them across the web. Each badge you earn contains data about the actions or skills you have mastered. This information can be viewed when you share your badges, informing viewers with details of your achievements. You will receive a Leadership Pulse badge when you sign up and complete the research demographic information sheet. Participating in 4 out of 6 monthly Leadership Pulse surveys or webinars will maintain active status of the badges and additional badge opportunities will be available as you continue to participate.